Why use a Maratek Flex-O-Wash? Control & lower operating costs. 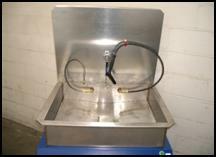 Increase productivity & lower parts cleaning costs. Work with crystal clean solvent every day. 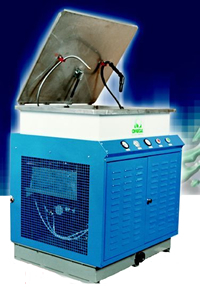 Reduce usage of waste recovery services. Variety of different solvents can be used. Built to industrial specifications. True Stainless steel sink. Use the solvent of your choice. Approved for use with SCAQMD Non-VOC solvents. PLC controlled for simple operation. Many specific options are available on the FLW-II models, tailored to meet your requirements and make these units integrate as seamlessly as possible into your production process. Options include FLW-II Satellite units that can be configured to work with a central solvent recycling unit. Contact Maratek to discuss your specific needs or for more details and equipment specifications.